We offer 15 camp sites ( 5- 50amp sites & 10-30amp sites) that include water and electric hook ups as well as access to our bath house and bathrooms. No need to "rough it" if you don't have to! 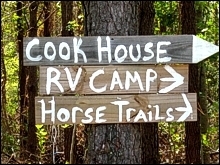 High tying or put up a portable fence for horses is allowed in woods behind camp sites at no additional charge or you may rent a stall for your horse at $20 a night. Camp sites are set in a tranquil setting 1 mile off of the road. You'll feel like you are a million miles from civilization, but the town on Robersonville is only about 5 minutes away. So if you forget something you won't have far to go in order to get it. Please come experience what we have been enjoying for years and see for yourself why it is worth the trip. Hook ups for horse trailers is $25.00 per night. There is a maximum of 2 people per camp sight. An additional fee of $5 per person per night is charged for more than 2 people.